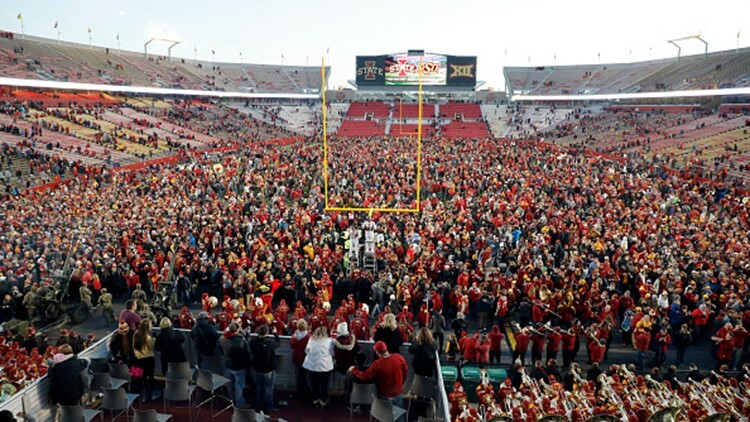 Iowa State Cyclones fans stormed the field after the Cyclones won 14-7 over the TCU Horned Frogs in the second half of play at Jack Trice Stadium on October 28, 2017 in Ames, Iowa. Whether you are someone who'd chug it or chuck it, Busch Light fits comfortably in many an Iowa State sports fan's cooler. It appears that anybody associated with rolling out the cardinal carpet is catching on. Both the Valero Alamo Bowl and the producer of the ninth-most popular beer in America are openly winking at this Cyclones phenomenon in the leadup to the team's football game against Washington State in San Antonio on Dec. 28. And there might be something more in store. The bowl's social media arm probably thought it was just playing along when it commented on a request from a popular Iowa State fan site Sunday night. ... Then the Anheuser-Busch InBev-owned beer chimed in. ... Before it's taken to biblical proportions. Busch, for its part, knew that the state does not discriminate in its appreciation. And that's how we end up with the surreal picture of Alamo Bowl CEO Derrick Fox sporting a big grin with a can of the stuff in his hand. "Some of (Iowa State's) people were here, and there was some Busch Light in our office. Someone said, 'Do you mind taking a picture?' And I said, 'Absolutely,'" Fox recalled in a phone interview with the Register on Wednesday. "We’re in the business of fun, when you get down to it, and you embrace what people are doing. You're celebrating a great season and reinforcing their level of enthusiasm. "... Hopefully the Anheuser-Busch stock hasn't already taken a hit (from my picture)." Now, this is usually where these cute little stories end. Fox, however, isn't done looking into options to make sure the taps run dry. Because look, central Iowans really are serious about this 4.1-percent ABV entry into the market of mass-produced light beer. Just ask WWE hall of fame wrestler Jerry "The King" Lawler, or anyone else who unsuccessfully tried to keep the supply flowing in Memphis last December for the Liberty Bowl. Or take a peek at any number of researched maps basically painting a Busch bull's-eye over our state. So it's not ridiculous for Fox to talk with San Antonio's local Anheuser-Busch distributor and discuss creative opportunities. Nor is it obsessive-compulsive to call up the Alamodome, the site of the 8 p.m. ESPN contest, and check on the concessions. "There are a variety of beverage options in the building, and we have inquired to make sure and see an additional complement (of Busch Light) available," he said. ... Give the people what they want. It certainly isn't a foolish idea, as Iowa State is going gaga over this particular bowl appearance. Iowa State athletic director Jamie Pollard announced Wednesday that the Cyclones have gobbled up their allotment of tickets 12,000 tickets (the stadium seats 64,000 for football) and are craving more. Breaking News: We sold all of our 12,000 tickets to the @valeroalamobowl. GOOD NEWS: Alamo Bowl Staff has allocated more tickets to us so keep on ordering tickets. We are almost at 13,000 tickets sold and counting! Lots of college-town fans will think they are schools with attachments to adult beverages, but Washington State is no slouch on the Busch Light front, either. In eastern Washington, the stuff is apparently called "Pullman Water." There's an urban legend that one of the city's grocery stores, Dissmores, at one point sold a statistically significant portion of the entire country's stock of Busch Light. And when ESPN's "College GameDay" made its maiden voyage to Pullman this past season, fans were flying the proper colors. So in three weeks, Matt Campbell and Mike Leach's football squads will take to the turf for what national pundits are considering one of the most intriguing bowl games of the entire postseason. Fans will hit the River Walk and the Alamo and the Pearl District and La Cantera and golf courses and hunting grounds and SeaWorld, and enjoy Christmas week in relative warmth. They may do so (hopefully responsibly) with a particular can of cold brew in their hands. And more power to them, Fox says. "These things are all in good fun," he said. "We've been very fortunate with a run of competitive games, comebacks, high-scoring games and fans tuning in. On social media, we're trending up. "A fan's teams qualify for the game, but they can help end up where the team goes. And next year, when Iowa State is in the running for a certain game, I could get calls from my counterpart (for another bowl) and I’ll hope to give a thumbs-up and say how they're awesome. "All indications are that from a travel perspective, those fans are absolutely living up to their support."